Life may often feel like a game of chess when we try to devise strategies in hopes that we obtain a content future. However, the essential ruling pieces of life are sometimes much less complicated than we tend to make them. Many people play the game of social status or a restrictive way of thinking — that you have to look this way to be successful, or to look stylish you must spend thousands ... Not so! There may be various boards to choose from, but if we learn to keep our own game boards long enough, we just might find solutions to our concerns embedded within the pieces that lay before us. As swift as the seasons come and the winds blow, one may wonder whether the board game of life has been played truthfully? In situations good or bad, and changes in home or work life we usually strive for a positive outcome — that kinging or queening moment where one is considerably satisfied. And why not? You work hard and believe that it's deserving, right? Yet, in times of doubt, you forget about your strategy, dismissing your instincts or perhaps you've forgotten how to play your own game! The checkers here represent a life style-board, an enchanting undertaking of not allowing others to tell you the "how to" in your (personal) rules of style, or in anything that you firmly believe. Though, we may lose a few of our game pieces from time-to-time, when we get back into it confidently, and in our own way, there's always a win! I believe that after taking a closer look, whether your game is advice, shoes, jewellery, or graceful poise, you've got some fabulous pieces to show! Stop comparing yourself to others, and get your game back! I was influenced by the multi-talented artist, Irene Rice Pereira. 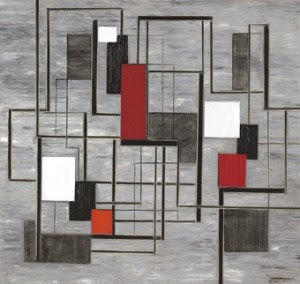 Many of her works involves lyrical and geometric abstractions that I simply love. Minimal Effects: Versatile accessory- the clutch. And look! No bracelets or necklace! This was tough, since I have fun new accessories that could go with this particular outfit. The goods: Clutch-Express, Shirt-Thrifted, Black headband-Layofashion,Shoes-Charles David, Belt-F21 seen here. I love how you highlighted the pink lips in the first picture. Makes for a great pop of color! I always love the outfits you put together! You look great in the checkered print and I love your hot pink lips! I loved what you had to say...it's so important to be yourself and not to compare yourself to others. Everyone has a different purpose in life...why waste yours by trying to live someone elses. Thank you for the pep talk---- it comes at a great time. And of course you follow it up with some great style photos!!! Love, love, love the first pic, Madison. You kinda KNEW I was going to LOVE this didn't you? Love the inspiration behind it (I think I need to learn more about this artist, thank you) and the outfit. LOVE the buffalo plaid and the sophisticated turn you give it. And the red pout- yes please! This is such a different sort of post for you, Mad, and I love it! "In times of doubt, you forget about your strategy, dismissing your instincts" - so true. I'm trying to learn not to let this stop me, though. I love those hott pink lips. I really enjoyed reading this post, and your explanation of the checkers. Makes you think. Love the first pick with the focus on the lip color! My Perfect for Bloggers Giveaway! Simple and so stylish. Love that pop of bold pink lipstick. Your inspiration is so fabilous! Loved this post and what you had to say. I found a lovely quote and image on Pinterest recently - 'Don't let comparison steal your joy' - so true! I'm sure some of us have wasted too much time dwelling on what we have/don't have. But the grass is always greener. I sometimes think we simply make lives difficult by over thinking too! Love your outfit - the first pic with the hot pink lips is my fave! *And yes Irene Pereira, a brilliant artist. I'm a huge Bauhaus fan. You're welcome! I'm happy that this aided in some way. Thanks so much. Thank you! very true & excellent quote dear. Enjoy your day and continue to be inspired. Love your inspiring post, so true! great post, thanks for reminding me that I don't need to spend thousands to look stylish. Sometimes I do go into this self pity pity thing, wishing that I could afford more.You're so right to say we don't compare ourselves to others. Contentment is joy. And this outfit is so appropriate for this post, you don't need lots of accessories to look good, a simple belt and clutch does the trick, you look chic as always! i'm totally in love with that lipcolor! and what a great black/white look! i love the first picture because of its black and white effect.. it made your outfit a classic!!! yes, being a fashionlover doesn't mean spending a lot just to buy expensive and beautiful clothes, by having artistic, playful and creative mind, we can truly express ourselves even at a least price of clothes or accesories but at a very elegant presentation of course!!! loved your blog... following you now.. hope you could visit my blog too.. kissess!!!! Omigosh so true! I often have to step back and ask myself what do I want because life really just spins sometimes and you forget you are making the decisions. OK, I gasped at your first picture. Love this outfit post from you...the message, and the fashion is fantastic. I agree, yes, there are blogs sort of forcing you to wear a certain something/ or type of style... but I like being ME, & when you show your true style the rest doesn't matter much. Happy Sunday dear. Thanks Kileen! I've bought 2 new red/pink lip colours and LOVE them! Aww, you two are lovely. THANK YOu so very much for the kind words. *So glad that you were able to check out this post dear. :) Happy Sunday. I love the thought that you put into this outfit! Thank you dear so glad that you like it..